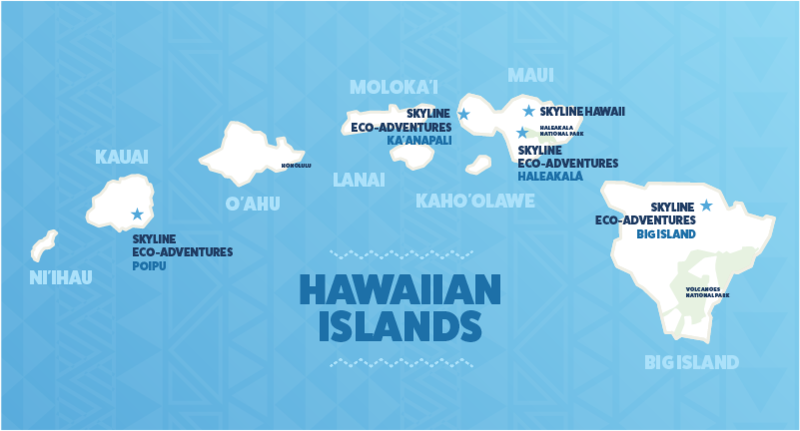 How Many Hawaiian Islands do you Know? The most well known Hawaiian islands are the eight largest of the island chain. But even with these eight islands being the largest, many people only know of four of the islands off the top of their head: Big Island, Maui, Kauai, and Oahu. It makes sense that these four islands come to mind first because they are the four largest of all. Skyline Eco-Adventures has zipline adventure tours on three of these four popular islands. We have a tour near Hilo on Big Island, a tour near Poipu on Kauai, and two tours on Maui. One of our Maui tour locations is in Ka’anapali and the other is on Mt. Haleakalā, near the entrance of Haleakalā National Park. The 8 largest are the most well known but there are 137 islands and 5 counties that, together, form the state of Hawaii. The 5 counties are Hawaiʻi, Honolulu, Kauaʻi, Maui, and Kalawao. Kalawao is a unique county because it is under the jurisdiction of Hawaii’s state health department. Hawaii’s other four counties each have their own local governments, just like the other counties within states in the United States. Big Island is the largest island in the Hawaiian island chain. There are five volcanos that make up Big Island’s land mass. MaunaKea is one of those volcanoes. Few people know that there is a lake just below the summit of MaunaKea called Lake Waiau. Big Island has the most volcano activity out of all of the Hawaiian islands. In fact, Kilauea is the single most active volcano on Earth. Skyline Eco-Adventures offers a Volcano N’ Zip Tour where guests can enjoy a zipline adventure followed by a tour of Volcanoes National Park. Maui is the second largest island of the Hawaiian Island chain. Skyline Eco-Adventures has two tour locations on Maui. In fact, we established the first commercial zipline tour in the United States on Maui in 2001 just outside of Haleakalā National Park. This zipline course is still one of our most popular and award-winning courses today! We also have an incredible zipline course located near the resort area in Ka’anapali. Maui’s most famous historic areas are Haleakalā National Park and the Road to Hana. Maui’s climate is very diverse in different parts of the island. Some areas are warm, tropical and lush while others, like Upcountry Maui, are drier and can be chilly at times due to the difference in elevation. Kauai is the third largest island in the Hawaiian island chain. This island is the wettest island in Hawaii. Because of its lush greenery and high rainfall averages throughout the year. Skyline Eco-Adventures also has a zipline course on Kauai in Poipu. Kauai has more beaches, rivers, streams, and waterfalls than any other Hawaiian island. This is due in part to its rainy climate. This island is also known as the Garden Isle. Oahu is known for its diverse culinary, entertainment and art traditions. This island is home to the state capital of Hawaii, the city of Honolulu. Molokai is the fifth largest island in the Hawaiian island chain. On this island, you will find a 500-acre coffee plantation and miles of untouched landscapes. It is called the enlightening isle because its remoteness helps you find yourself and reset your perspectives about life. This Hawaiian island is known as the pineapple island because in the early 1920s and through most of the twentieth century, it was home to a plantation that produced three-quarters of the world’s pineapples. Niihau is the seventh largest Hawaiian island. This island doesn’t receive a lot of rainfall so its climate is very desertlike. It is known as the forbidden island. It is located off the coast of Kauai and only about 200 people live here. Kahoolawe is the smallest of the eight main Hawaiian islands. There is no permanent population of this island. The only way to visit this island is by participating in volunteer work opportunities, otherwise, it is completely off-limits to the general public.